I had been warned in advance. A few days prior to my visit, I announced my impending visit to the capital of Niedersachsen, Hannover on my Facebook page. Within minutes, it was a bloodbath. 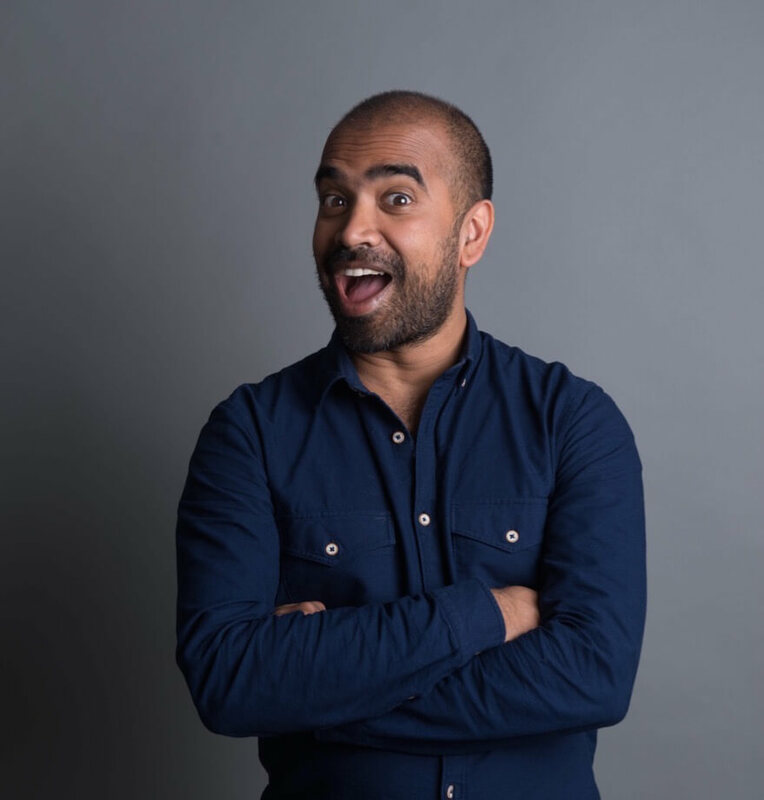 I was inundated with a barrage of negative comments about the city. I was travelling to Hannover at a pretty bad time of the year. It was the last week of March and the average daily temperature was a bone chilling -1c. The 13th largest city of Germany rarely features on the list of must-see cities of the country. However for me that was kind of exciting to hear. 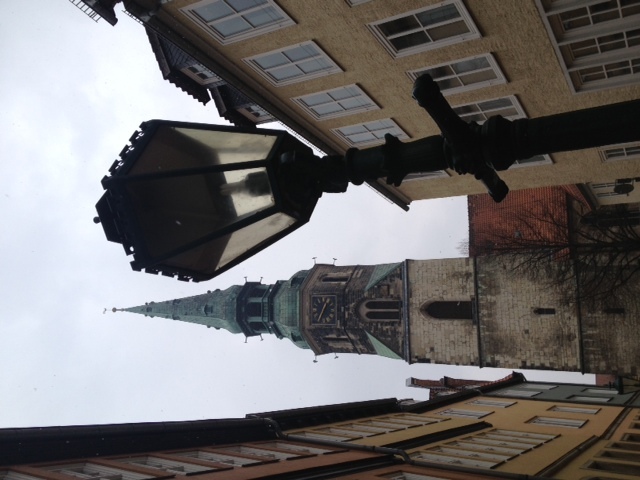 I was visiting a city that was unfashionable to visit for tourists. GREAT. It’s quite refreshing often to visit places that are not in vogue. Why does the city get such a bad rap? 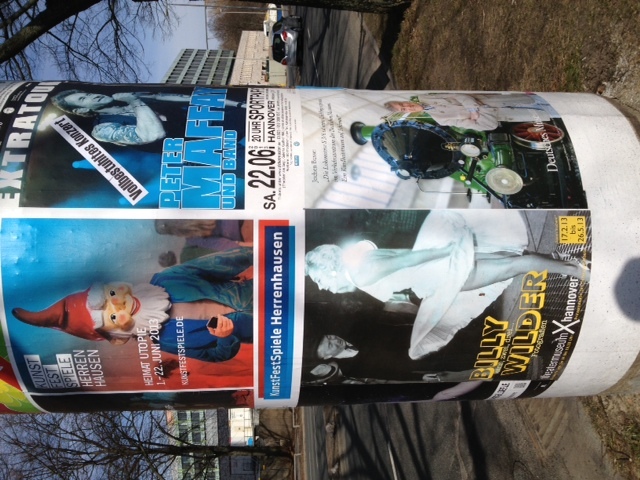 Hannover is famous for its fairs. It organises the world’s largest industrial fair every year, the Hannover Messe which hosts upto 6,500 exhibitors and 250,000 visitors. The city also plays host to CeBit, the world’s leading trade fair for information and communications technology and is a spinoff of the Hannover Messe. Hannover is famous for its acres of greenery and has one of Europe’s finest baroque parks, the Herrenhauser Gardens where amongst many things, you can see the artist, Niki de Saint Phalle’s grotto. 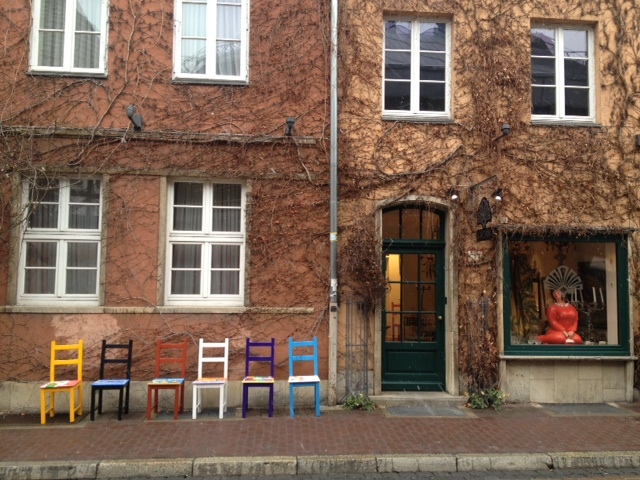 In fact, while she was born near Nice, Hannover remains in many ways , the spiritual home of the artist. Niki de Saint Phalle ? 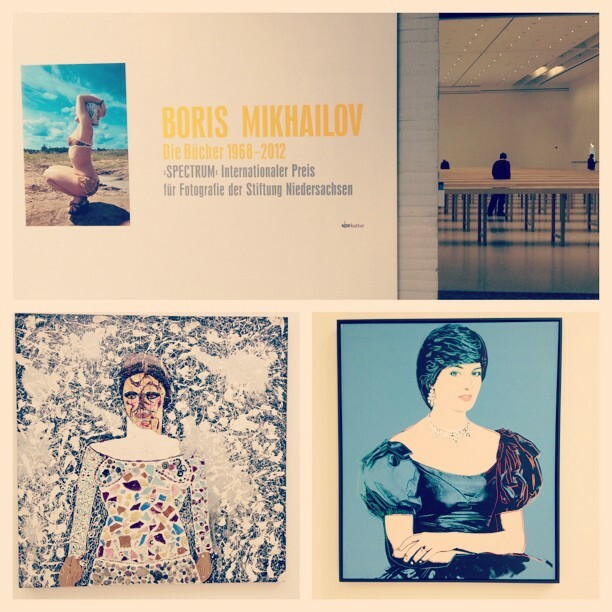 I didn’t know who she was until visiting a fantastic exhibition of hers at MAMAC –Musee d‘Art Moderne et d‘Art Contemporain in Nice last year. Niki de Saint Phalle’s work has a timeless, lighthearted, infectious, colourful and dreamy quality about her. It takes me to a world of fantasy, adventure, dragons and treasure quests. 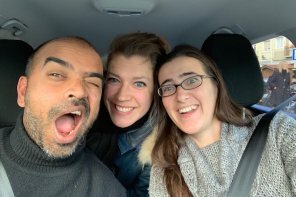 Visiting Hannover offered me an opportunity to dip into her amazing world thanks to the strong connections she enjoyed with the city. 48 hours was perfect to get a feeling of the city and judge for myself whether its dull reputation was ill-deserved or not. My first port of call in Hannover is the tourist information office on Ernst August Platz, opposite the railway station. 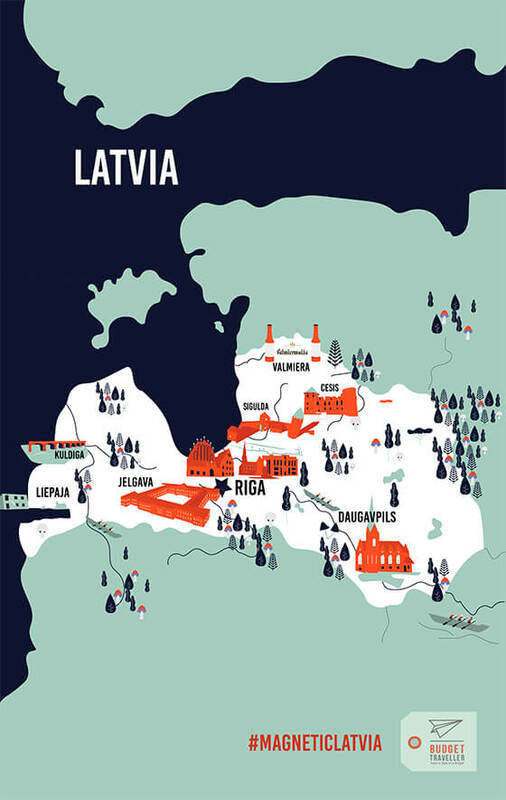 You can pick up here a copy of the ‘The Red Thread’ guide- a personal floorline city guide that allows visitors to discover the city at their own pace. Following the city’s cool 4200 metre long ‘The Red Thread’ I go for a ramble , checking out the architectural and historic sites of the city. Cost: ‘The Red Thread Guide’ costs €3 but is well worth the investment. My first stop on the red thread is the classic building of the ‘Opera House’ which was recently voted as one of the top opera houses in the world. Following the Red Thread, just before crossing over Osterstrasse, I come across the beautiful ruins of one of Hannover’s oldest churches, the Aegidienkirche. The Allied air raid of 1943 damaged the church badly. 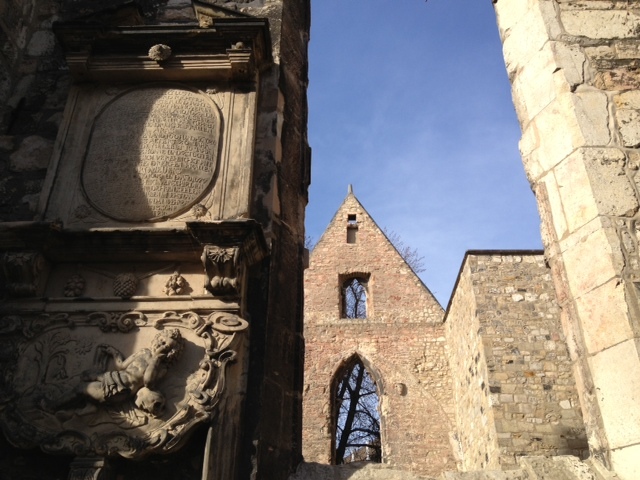 All that is visible now are the outer walls and parts of the Baroque Tower. The church has reinvented itself as a memorial to the victims of war and violence. I wait till 12.05 to hear the church’s ‘peace bell’ ring. This bell was presented to the church and city by it’s twin city, Hiroshima. Visitors can hear the bells toll at the following times: 9.05, 12.05, 15.05 and at 18.05 in the evening. Peace bell also is rung at an annual memorial service on 6th August in rememberance of the dropping of the atomic bomb on Hiroshima. 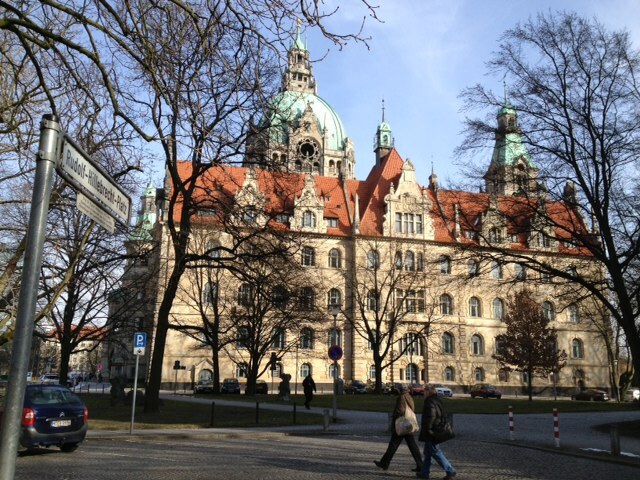 I pay a fleeting visit to the Neues Rathaus, the New Town Hall which is one of Hannover’s most iconic landmarks. My main reason for visiting here is the view. The Hall has a viewing platform, 98 metres high, which you access via a unique oblique lift. On the top, you get a great panoramic view of the city and can see as far as the Harz mountains on a clear day. Unfortunately, on the day I visited, the weather was pretty dire and the viewing platform was closed. It wasn’t an entirely wasted journey. Inside the town hall itself (which is free to visit) you can see 4 models of the city, from the Middle Ages till the present day. It gives you an idea of how beautiful the city was back in the day and how badly the city was destroyed during World War 2. No, this is not Venice 🙂 This is the Leine Palace Bridge in Hannover, just around from the New Town Hall whose cupola you can see in the distance. 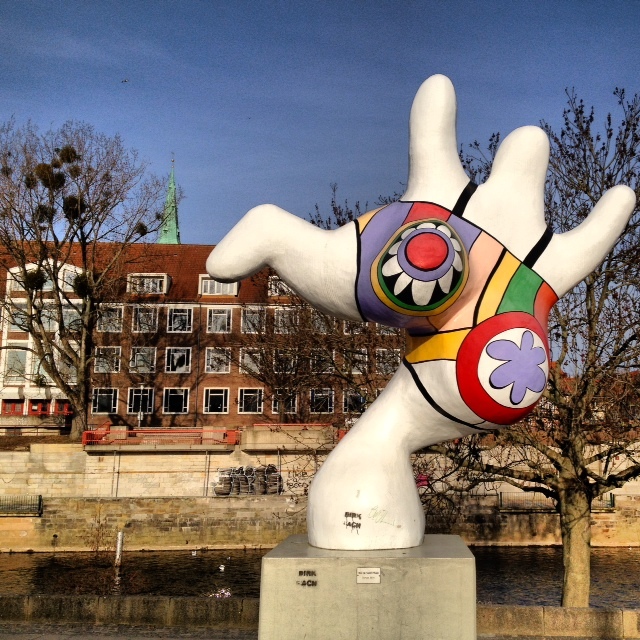 This is one of the three buxom, colourful Nanas on Leibnizufer that Niki de Saint Phalle sculpted for Hannover in 1974. Initially met with intense public dislike , the ‘buxom girls’ are now proud mascots of the city. Despite being bombed extensively during WW2, in stark contrast to the modernity of the new town, Hannover’s Altstadt has managed retain its medieval rustic charm and character, giving the visitor an alternative perspective of the city. 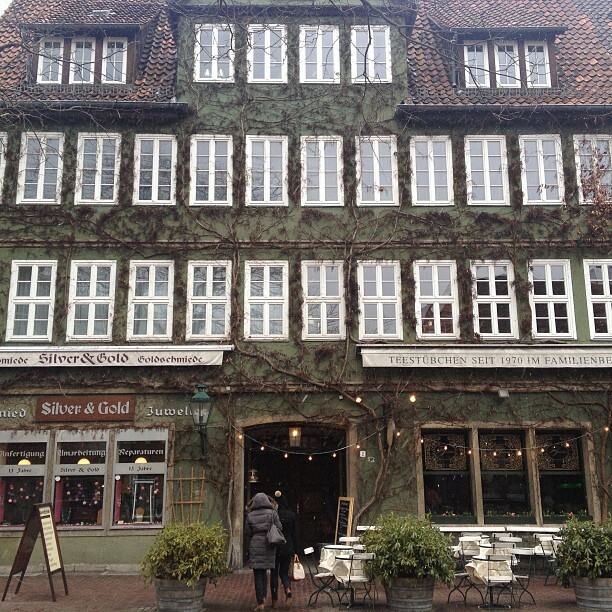 My favourite building in Altstadt was the Ballhof-Hannover’s oldest gymnasium. Now a tea house, this beautiful building is a glimpse into the regal golden era of the city and gives the visitor an idea of the the architecture of the Altstadt before the majority of it was razed to the ground in World War II. Built between 1649 & 1664 , the Ballhof was as a place for badminton and festivities for Duke Georg Wilhem. Afterwards, I head off to the hip Linden district of Hannover. 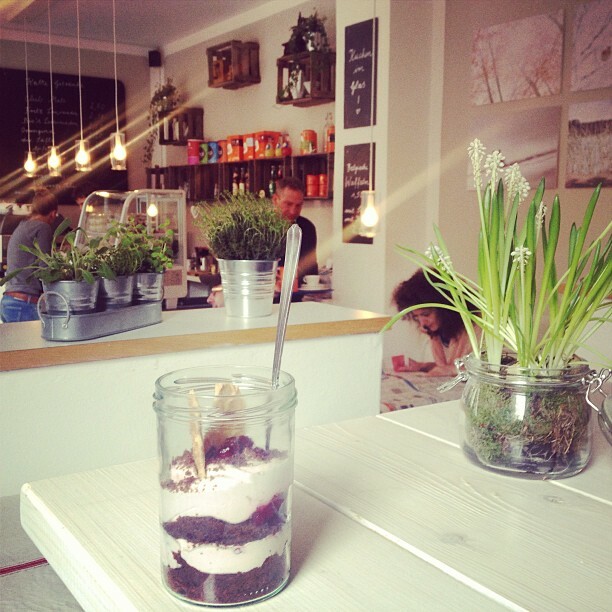 Here, I discover a very cool café called Kaffeepause. It’s a very chilled out, happy place with a few locals gossiping away or reading the papers. The place offers great coffee and amazing desserts like chocolate brownie raspberry mousse which you can admire in picture. 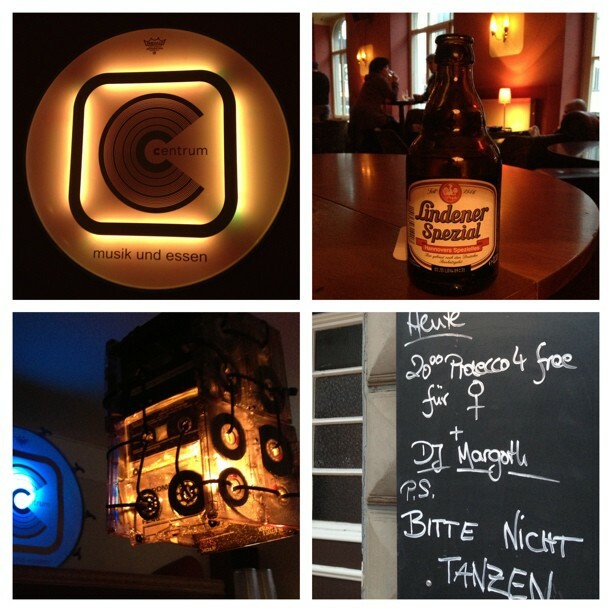 After Kaffeepause I head to Centrum – musik und essen: a cool bar in Lindener Marktplatz. It’s nice and warm inside. I really enjoyed the nice chilled out vibe, free wifi & indie tunes over a few of the excellent local ‘Lindener Spezial’ beers. 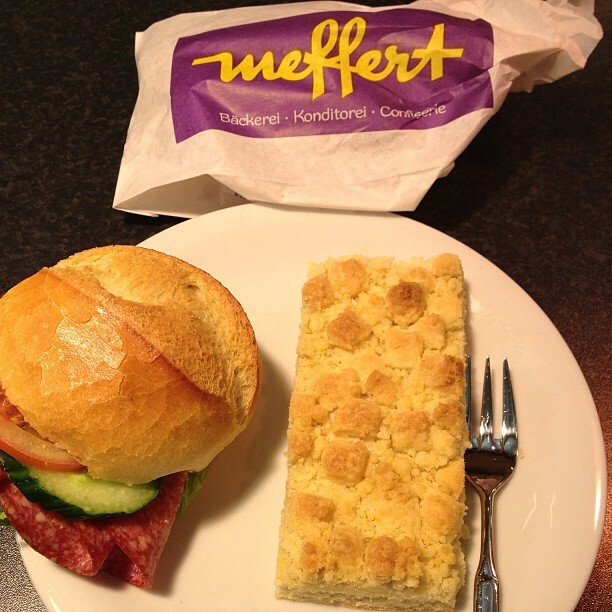 They do pretty decent grub and I opted for some Wiener Schnitzel with fried potatoes and a salad. Portion size was huge and very filling. After 8pm , place goes crazy with a cool offer of free prosecco for the ladies accompanied by a live DJ set. That was the cue for me to leave and head home. Top tip Hannover is a very compact and walkable city. 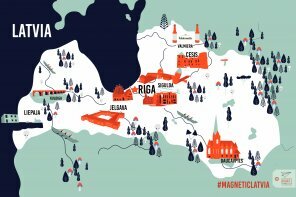 If you are living outside the centre of town note that single tickets currently cost €2.40 and day passes €4.70. I first nip over first thing to Lindener Marktplatz for their excellent Saturday morning ( also held on Tuesday ) market. Here I feast on a whole bunch of treats enjoying nutella crepes and some fresh fruit from the market stalls. Whether you are looking for some bread, cheese, any organic products or even a nice cup of freshly brewed coffee-this marketplace has it all and is a lively congregation of locals. 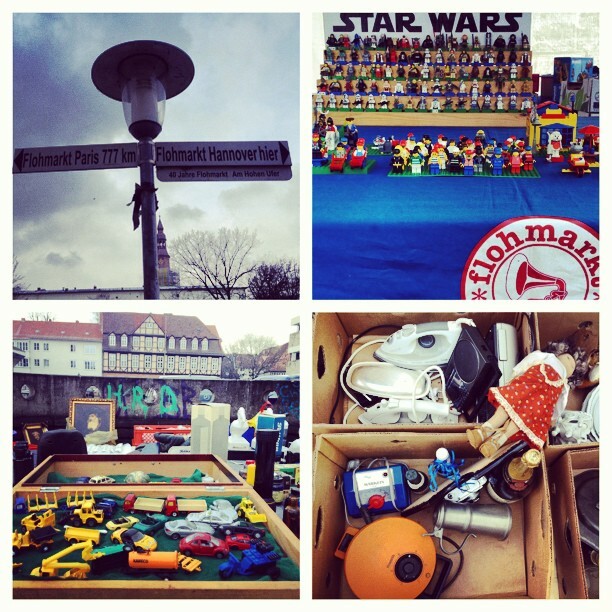 I scoot back to the Aldstadt and spent the rest of the morning pottering around the Hannover Flohmarkt- Germany’s oldest fleamarket which takes place every Saturday from 7am to 4pm.. You can find a whole mishmash of stuff here – from old cameras and antique trinkets to Star Wars Lego models. 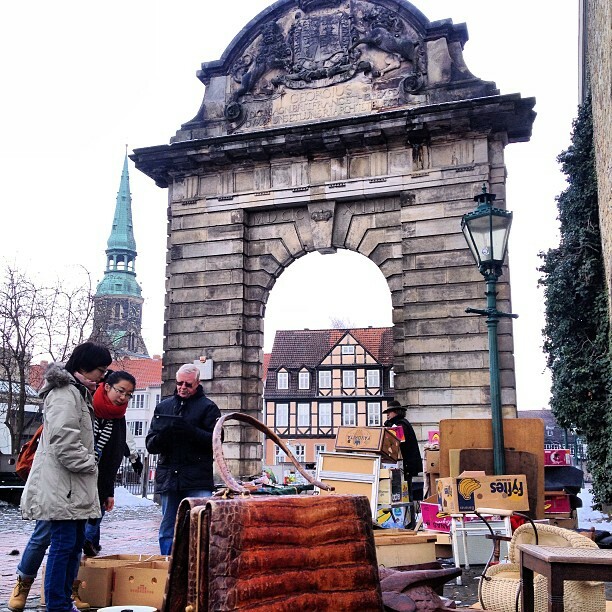 Against the backdrop of the fleamarket, I got the chance to admire the magnificent archway – the Marstalltor which bears the arms of King George I of Hannover and….. Great Britain. Stone’s throw away is also the Waterloo column which commemorated the victory of Prussians, Hannoverians & Brits over Napolean. From 1714 till 1837 the British monarchy jointly ruled Great Britain and Hannover. The union ended with birth of Queen Victoria. The german connection with British royalty doesn’t end there. Victoria then married Prince Albert of Saxe-Coburg-Gotha. So the Brits and Germans have much much more in common than you would think. To read more about life in Hannover under British rule, I recommend popping into the Museum of History down the road. 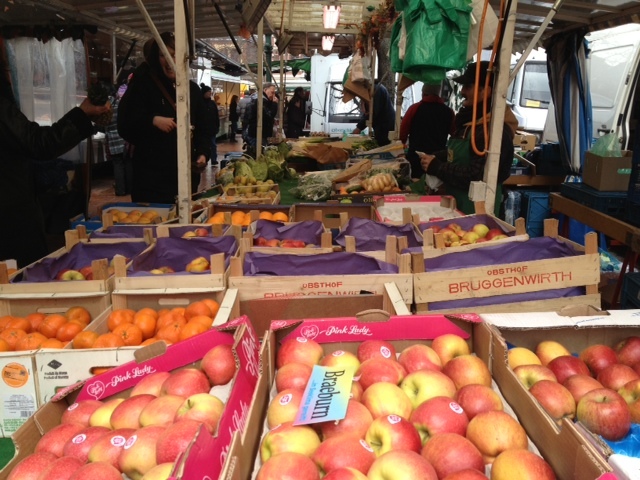 I nip into Market Hall which is a treasure chest of regional and international delicacies. Place is rammed with locals having a quick bite with friends during their lunch break. 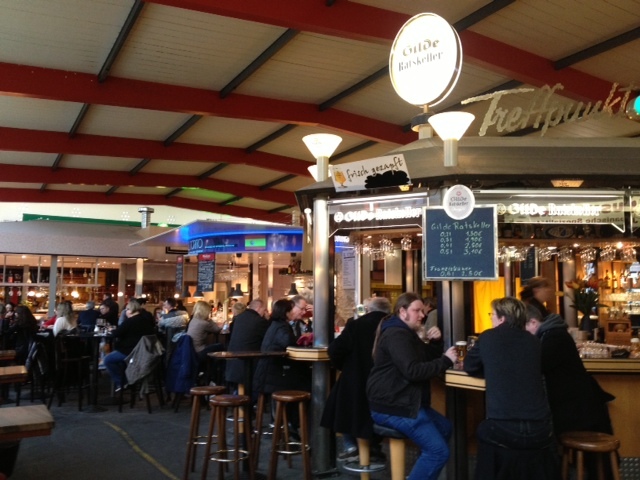 I dive in and grab myself a bratwurst with a small glass of the local Gilde Ratskeller premium pils. Afterwards I head off to Lake Maschsee, a huge artificial lake that in the summer is a paradise for water sports lovers and a place to relax. 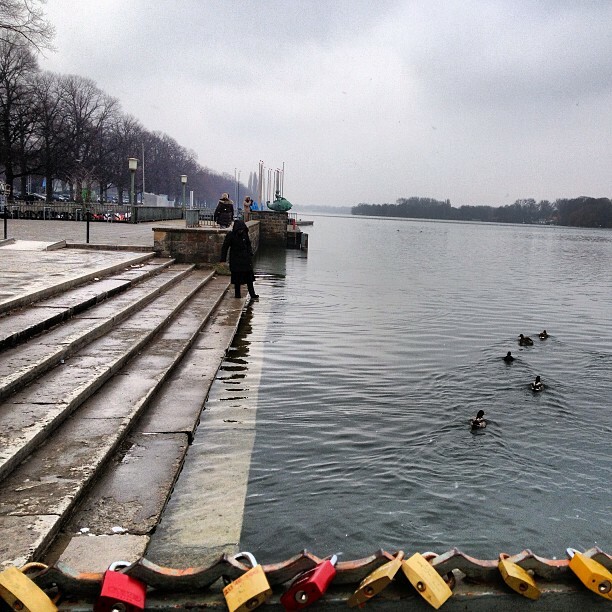 However, in winter , it is rather bleak, just a few love locks and floating ducks to be seen. It was perfect few hours, especially with the snow falling outside 🙂 Normal entry price is 6 euros for all areas but you can visit for free on Fridays. 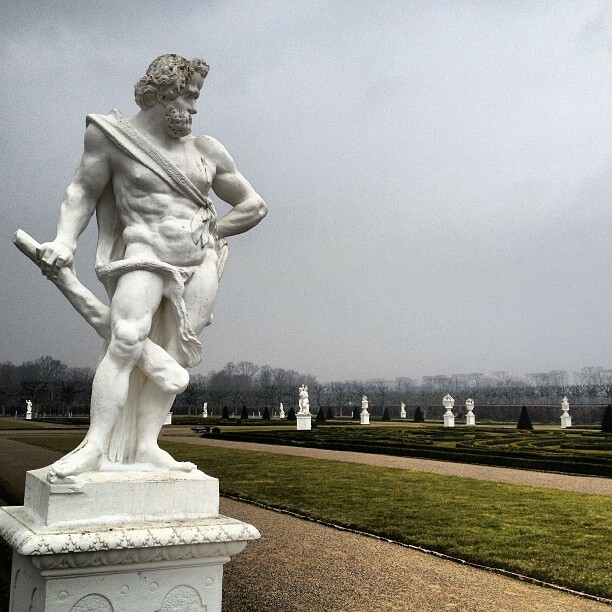 In the winter there is a stripped down, austere beauty about the Herrenhausen gardens. Bare trees & flower beds against a cold grey sky. Still Hercules and others stand defiant as you meander through the endless maze of gardens and lose yourself plus enter the beautiful Grotto designed by Niki Saint de Phalle. I could only imagine how beautiful this place must look like in the summer. A place I’d definitely like to revisit when the weather is much better. 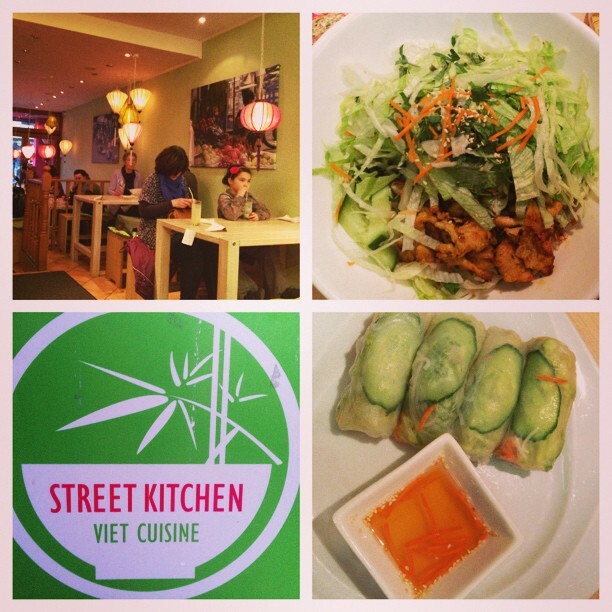 For my evening meal I head to Street Kitchen on Limmerstrasse what is possibly the best Vietnamese diner in Hannover. I start with a local Hilde beer & Vietnamese summer rolls followed by Bun bao xa sa. Instead of beef , I have tiny strips of chicken marinated in lemongrass, garlic and curry sitting on a bed of vermicelli noodles and lettuce, cucumber and mint leaves with liberal amounts of fish sauce- this was a very tasty dish. 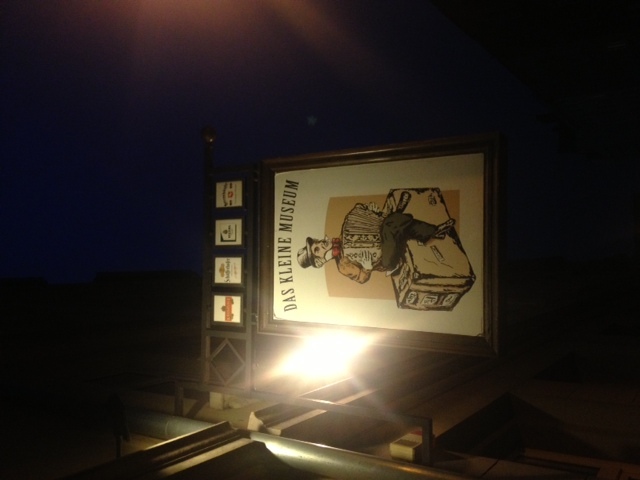 The Das Kleine Museum is a museum with a difference, doubling up also as a restuarant serving a variety of classic French and German dishes. It has an ambience that can be described as quirky. The ceilings and walls are filled with memorabilia that the founder of the place, Rudi Reese found on his world travels. Two large crocodiles salute guests from the ceiling while wood-paneled walls are decorated with ships, pictures and lanterns. Food is excellent here and well priced. I wind down my day and my 48 Hours in Hannover with a cup of their excellent coffee and attempting to read the latest edition of the Bild. Overall, it was quite an action packed 48 hours in Hannover. 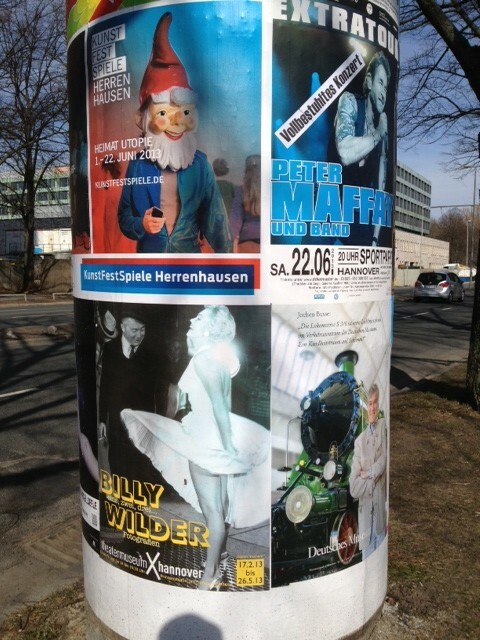 Lots for me to see and do in Hannover over 2 days. I visited museums with some of the best collections of modern art in the world, walked around the beautiful baroque gardens of Herrenhausen, hanged out in some cool neighbourhoods like the Linden district with it’s hip bars and cafes. 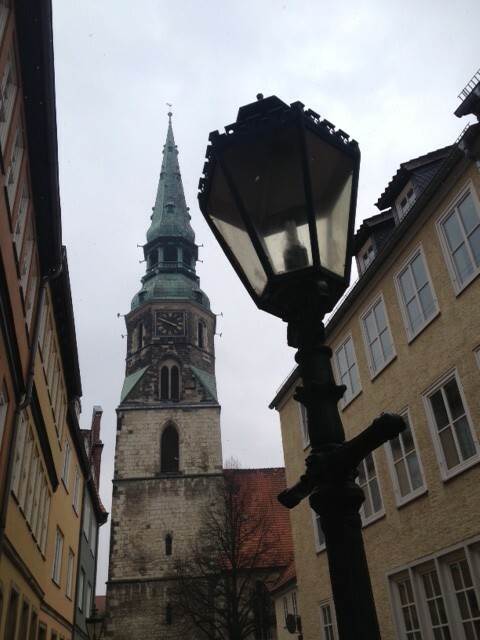 Then you have the unexpected charm and beauty of Hannover’s Altstadt which contrasts with the ugly modernity of the city. 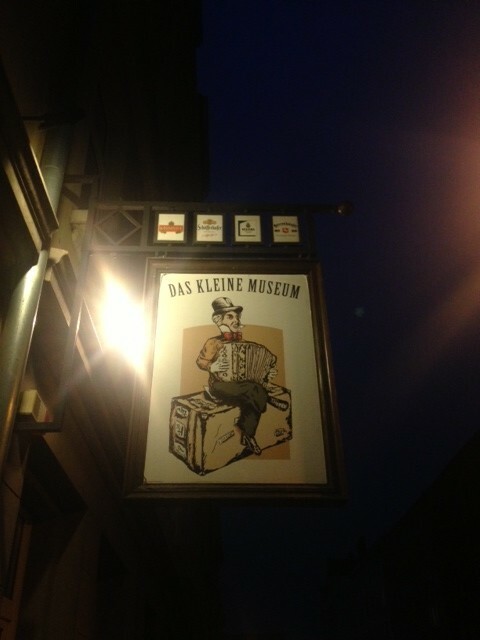 Hanover, I must conclude was far from dull. You just need to dig deep to see its true self. 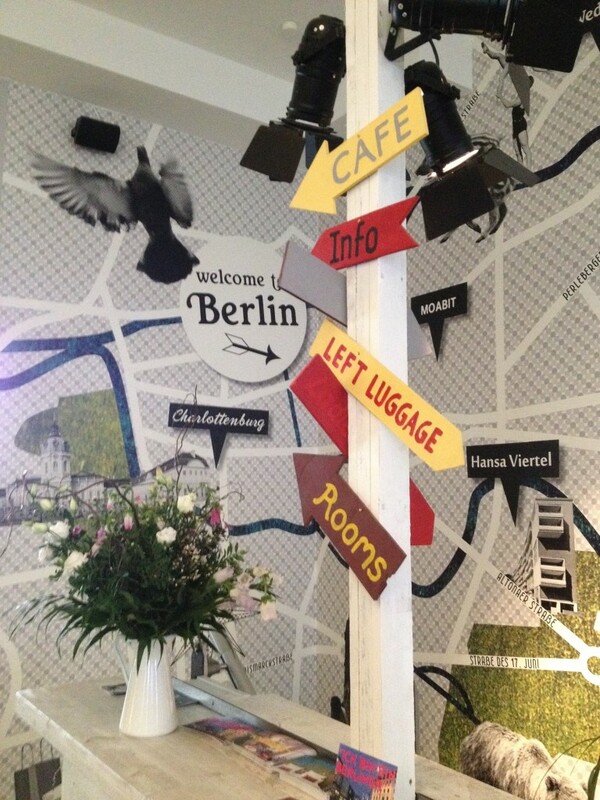 I stayed 2 nights at the Jugendherberge Hannover. It’s a clean, comfortable hostel , slightly out of town next to the football stadium. You can choose from doubles and dorms that sleep four, some with ensuite facilities and others with shared but very good bathrooms. The U-bahn stop is a good 10 minute walk away ( 4 stops into the city) so if you are comfortable walking that distance, then this is a decent budget option. Note that there is no common room, no organized activities and wifi is restricted to the lobby area. Its a cheap, decent base with good breakfast. 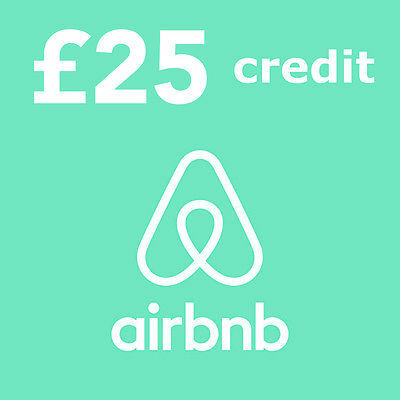 With ensuite bathroom and breakfast, cost per night is €43 per person or just €33 with shared bathroom option. There are frequent train services via Deutsche Bahn to Hamburg (€36, 1¼ hours) Berlin ( €53, 1½ hours) Cologne (€56, three hours) and Munich (€101, five hours). Big thanks to Miriam Beschoten , Dr Isabelle Schwartz from Sprengel Museum and the Hannover Tourism Board for their support during my trip. 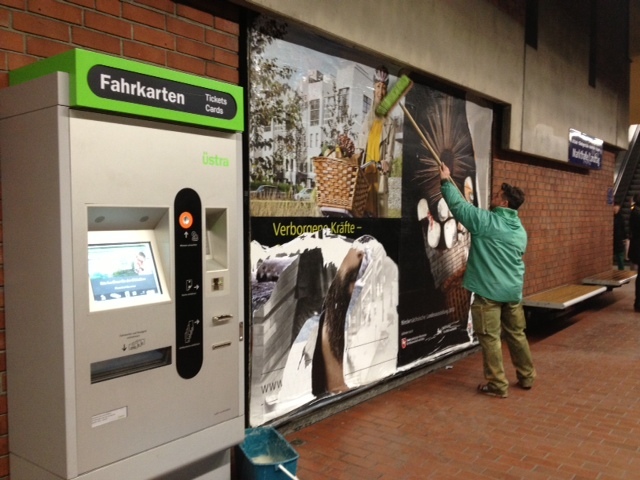 Check out the Hannover Tourism website for more tips about things to do in Hannover. 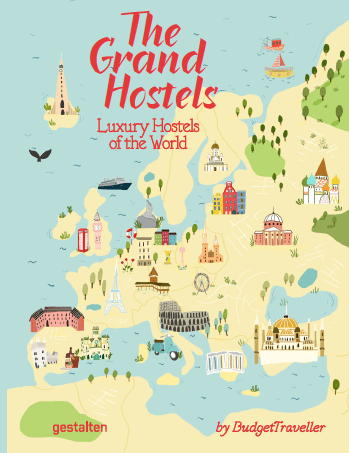 Also a big thank you to Catharina Fischer, Martina Dege and the German National Tourism Office , their partners for the ‘Youth Hotspots’ campaign – Jugendherberge : The German Youth Hostelling Association and Deutsche Bahn for sponsoring my ‘German Wanderlust’ tour. Find out more about these hotspots at their website , feel free to add your own and also do download their free youth hotspots app that is now available on the Apple Store & Android Store . 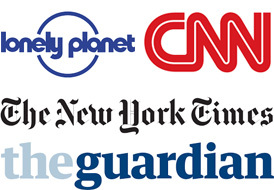 Please note: While my trip has been sponsored, the views and thoughts represented in this article are my own. Yey! I’ve been waiting for this for so long now! Thanks so much for paying a visit to Hannover, Kash! What an amazing article! 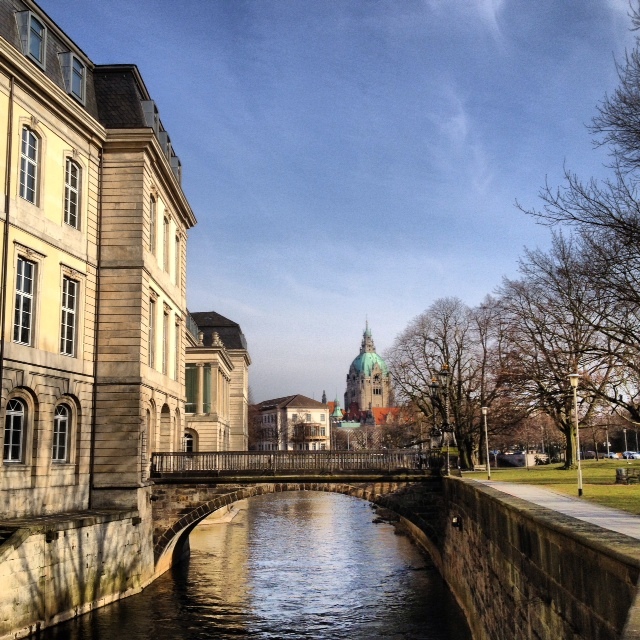 We love when people show how beautiful Hannover is to the world. We are a Spanish-language magazine about Hannover. 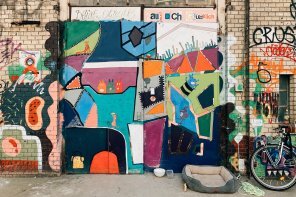 If you want to check some more pictures and recomended places to visit while in Hannover, as well as some history, please go to azucarundkalt.com! thx for the nice article, It was a great read! Gracias! Much hated and misunderstood city that deserves more love. Will check out your site. 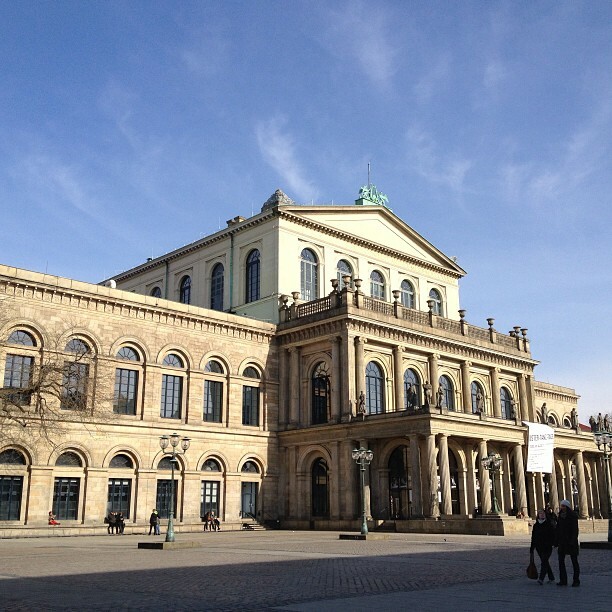 Great article and a few new things to add to my itinerary when visiting Hannover next month!